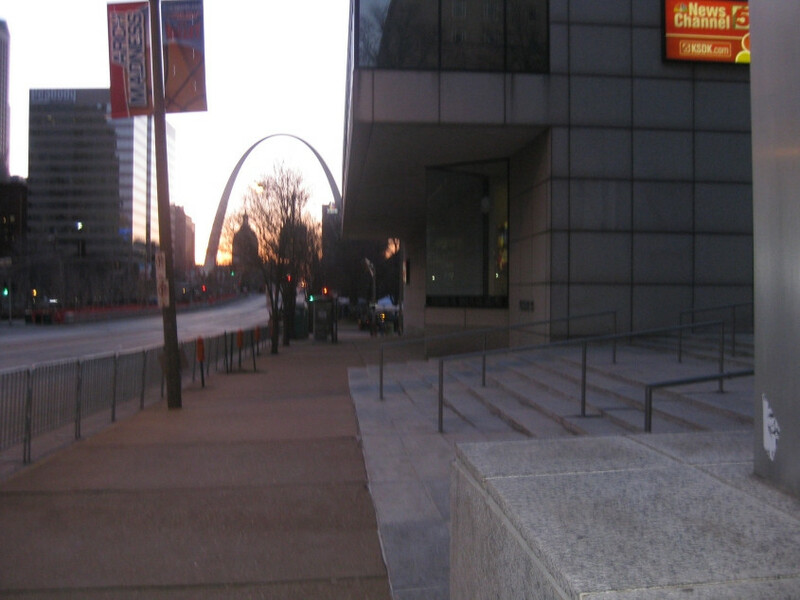 Although my Greyhound bus arrived in St. Louis late, I still had plenty of time to wander around town before the roadmeet beginned. 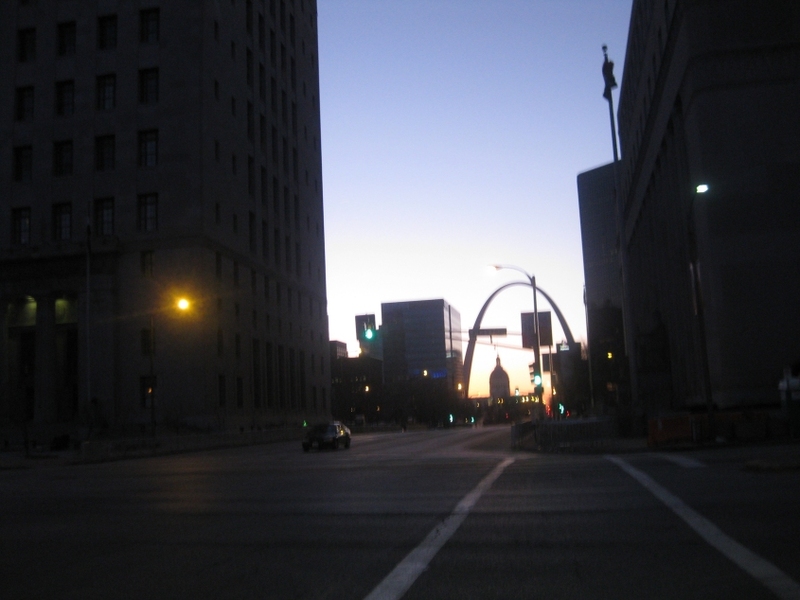 (The travails on the way to St. Louis were nothing compared to those on the way home, when Greyhound caused a series of delays that made me get home 6 hours late.) This photo is west on Poplar Street near 15th. 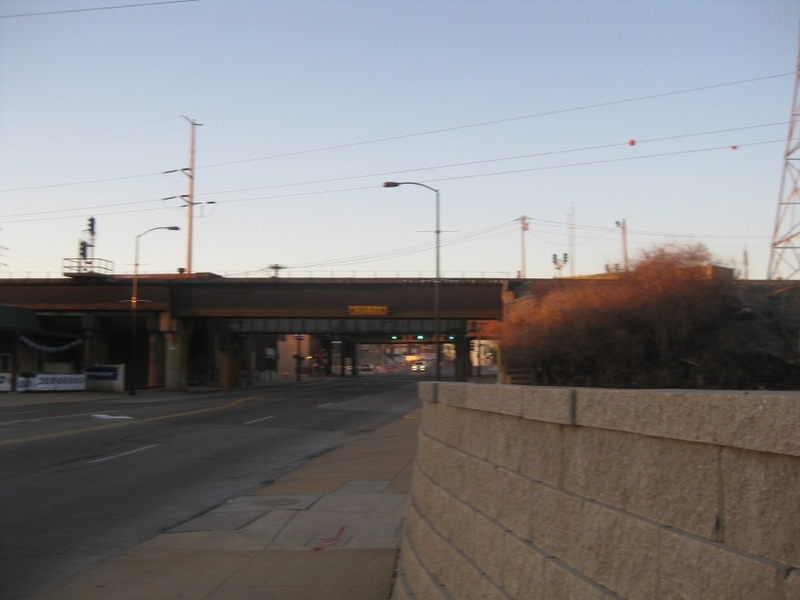 The elevated road on the left is the ramp from 14th & Clark to I-64 west. West on a transit center driveway off 14th & Spruce. (Spruce used to continue straight ahead here.) The ramp overhead is again the one from 14th & Clark. 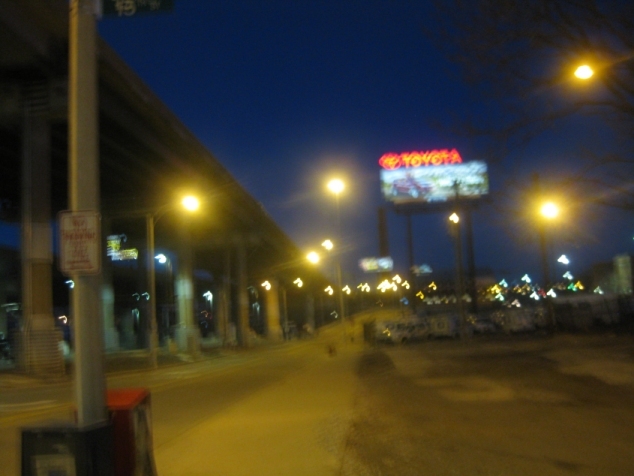 I-64 is elevated in the background. 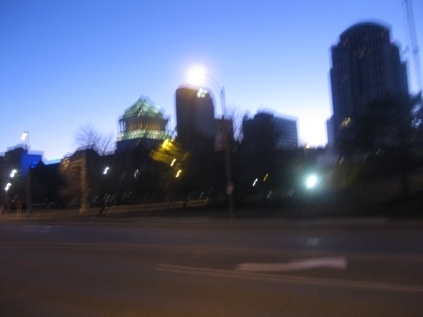 South on Tucker Boulevard (the former 12th Street) at Clark. 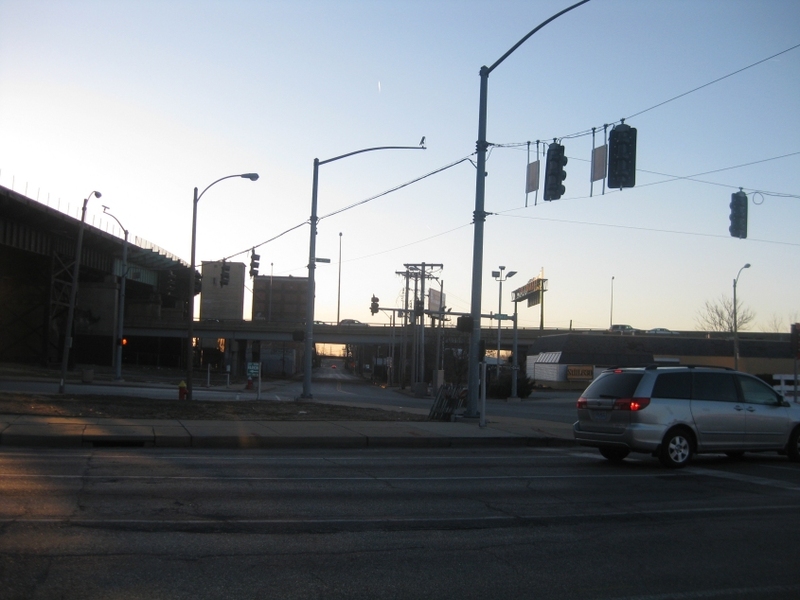 A double-decker stretch of I-64 is deep in the background. North on 11th from Market. East on Market. 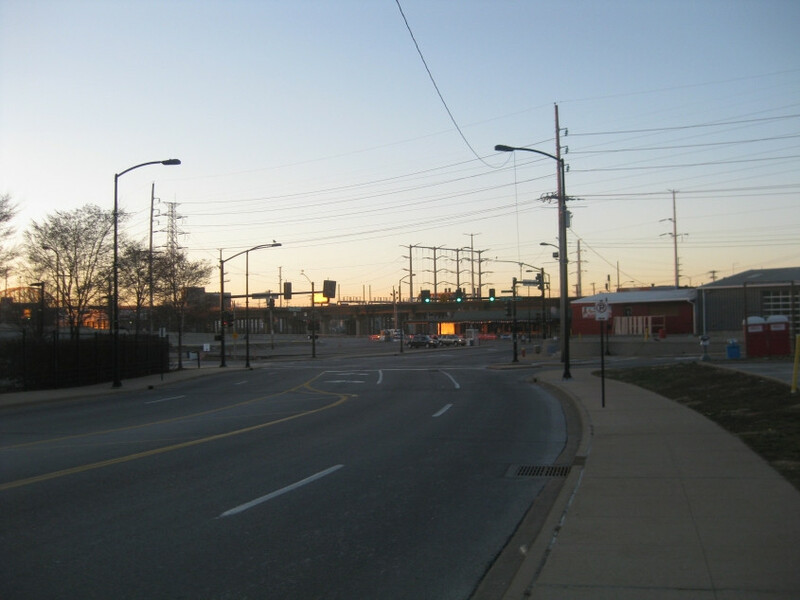 Market Street was once US 40, before US 40 was moved to what is now also I-64. Somebody stuck a sticker with an Occupy mask on the wall at right. South on 9th at Market. Right here, 9th goes under part of the Bank of America Plaza building. Wikipedia calls the 1982 skyscraper "award-winning." North on 8th. 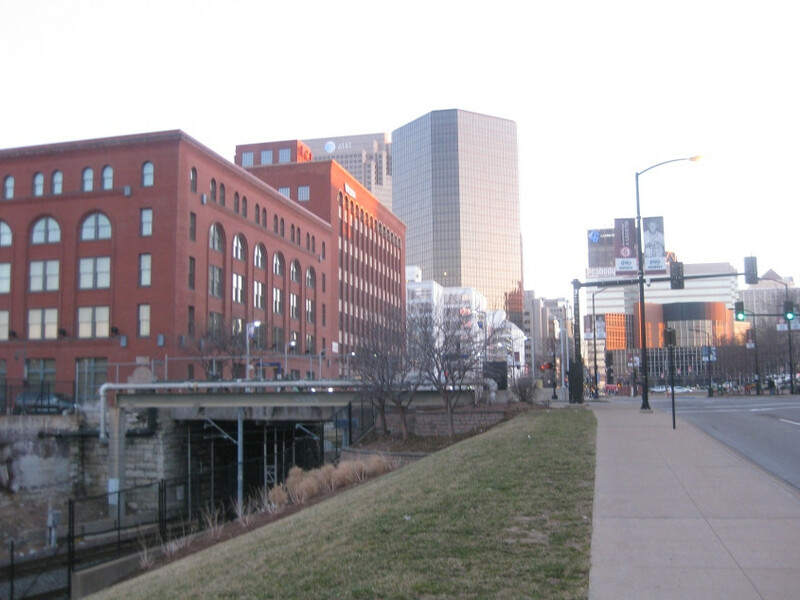 The tracks are for St. Louis's local commuter rail. Apparently the train station is tucked under 8th Street here. West on Spruce at 8th. Up ahead, Spruce goes under a ramp from I-64 west to Clark Street. 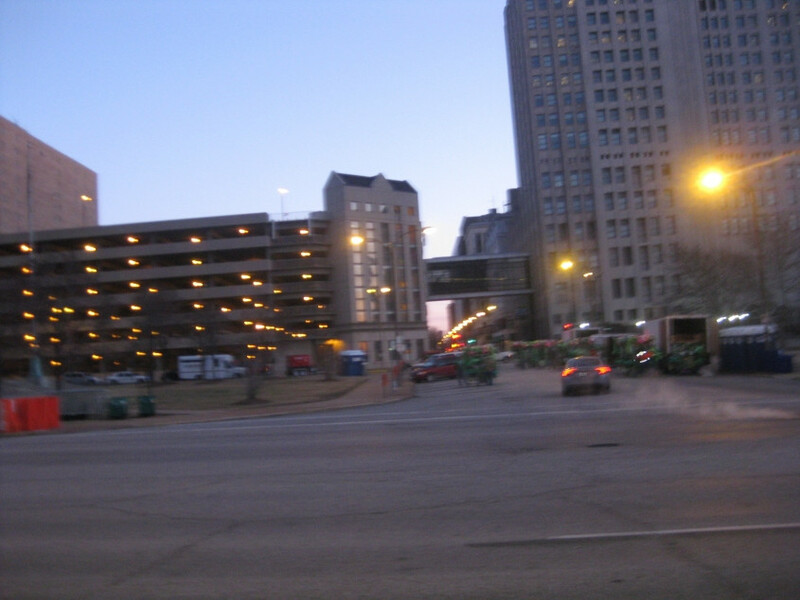 South on 8th, we go under the double-decker I-64. North on 8th. Spruce Street is on the left, going over the commuter rail. West from 8th, I-64 is on the right. 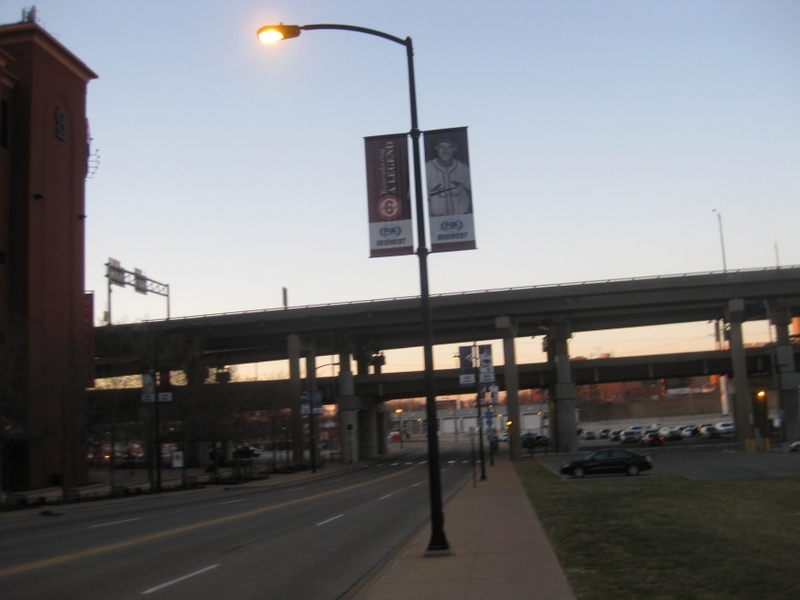 The overpass in the distance is a viaduct on Tucker Boulevard that goes over some rail features - and under I-64, as you can see. 8th Street curves and becomes 7th. The MacArthur Bridge is visible at far left. East on Cerre Street from 7th. 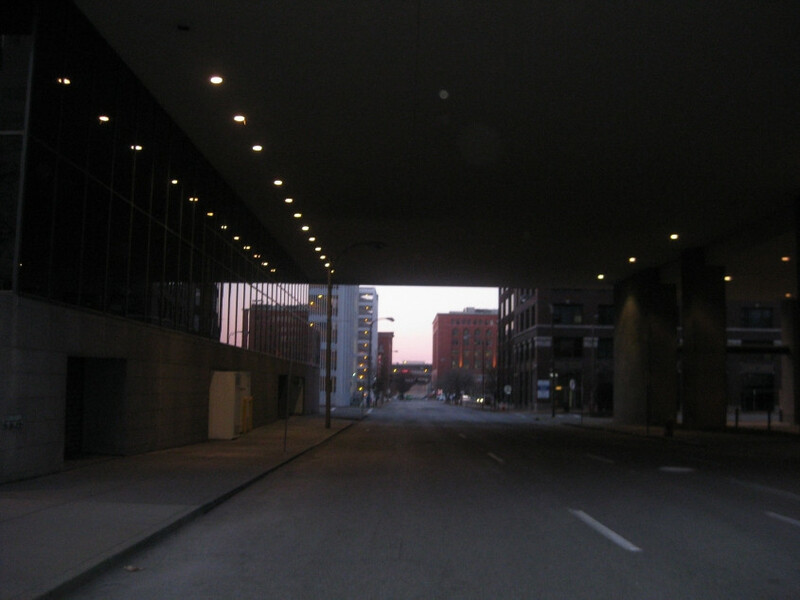 The dead end is at a ramp from I-64 east to 6th & Gratiot. 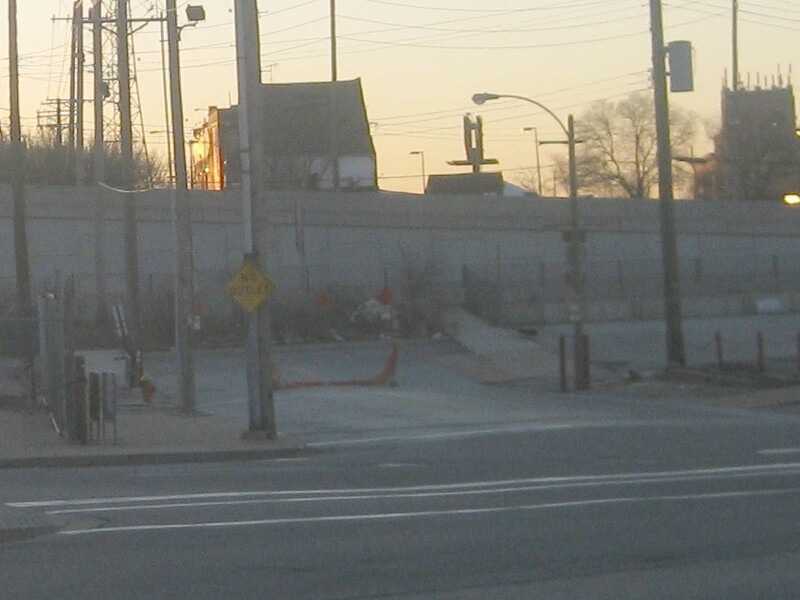 The wall behind that holds a ramp from 6th & Gratiot to I-64 east. Cerre used to continue straight through. Sixth Street used to run where the ramps are now. South on 7th. 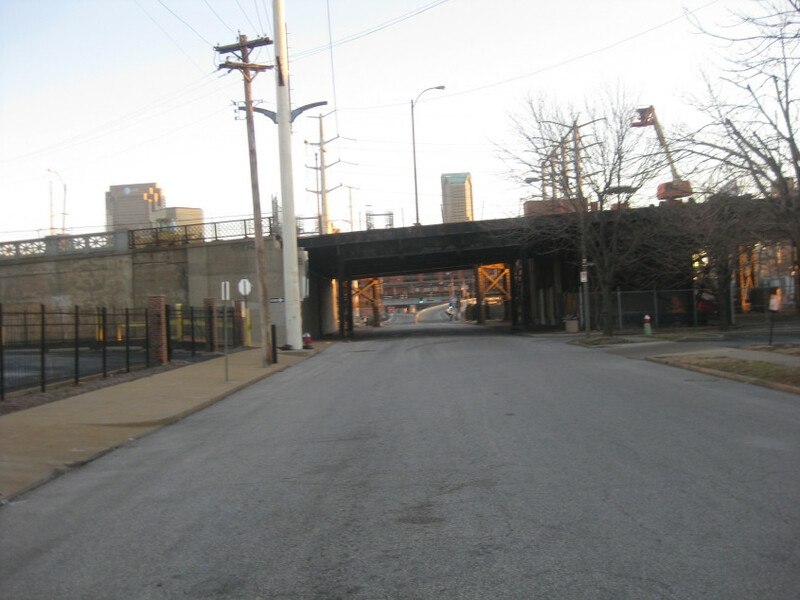 We go under a bridge for a rail line that splits from the MacArthur Bridge approach and runs northeast into several tunnels near the riverfront. North on 7th. 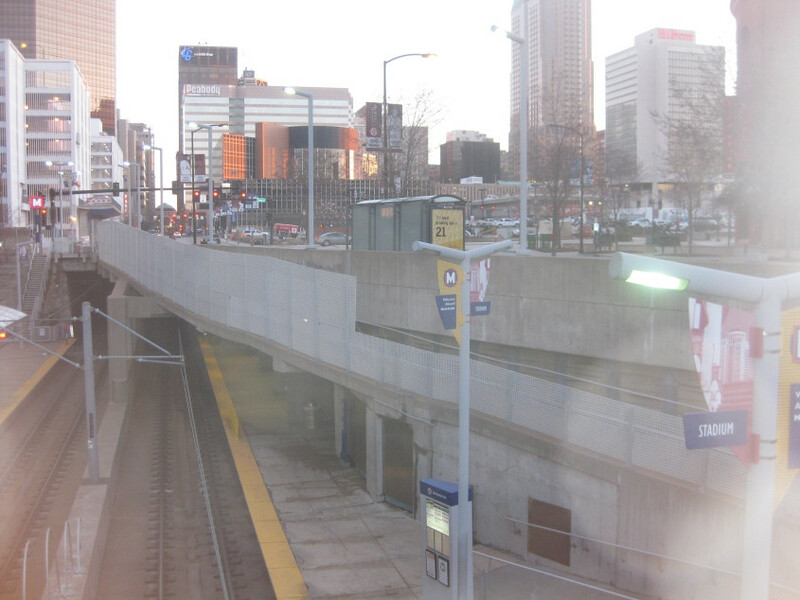 The rail line on the overpass runs east to the riverfront and curves south. 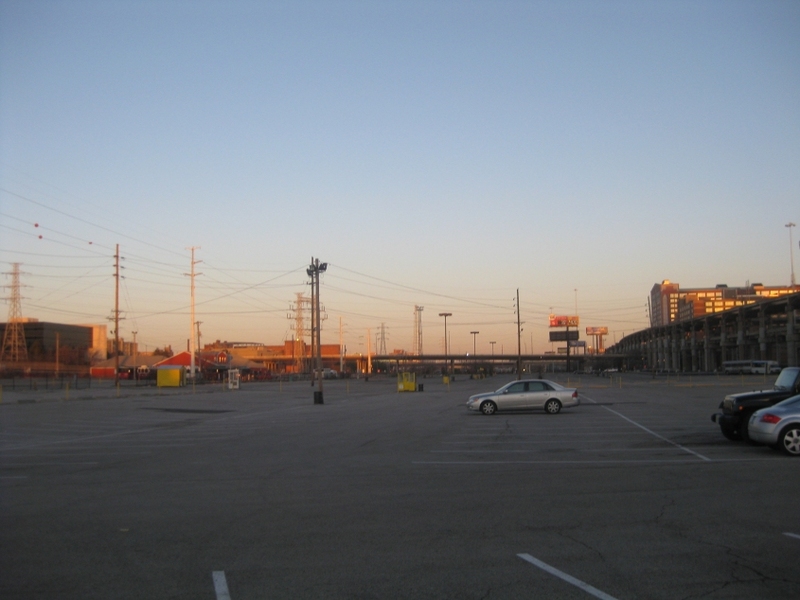 The Cardinals stadium is in the background. "MacArthur Bridge is melting in the dark..." Here we're on 7th, and we're looking east up an abandoned ramp that descended from the now-closed road portion of the MacArthur Bridge. 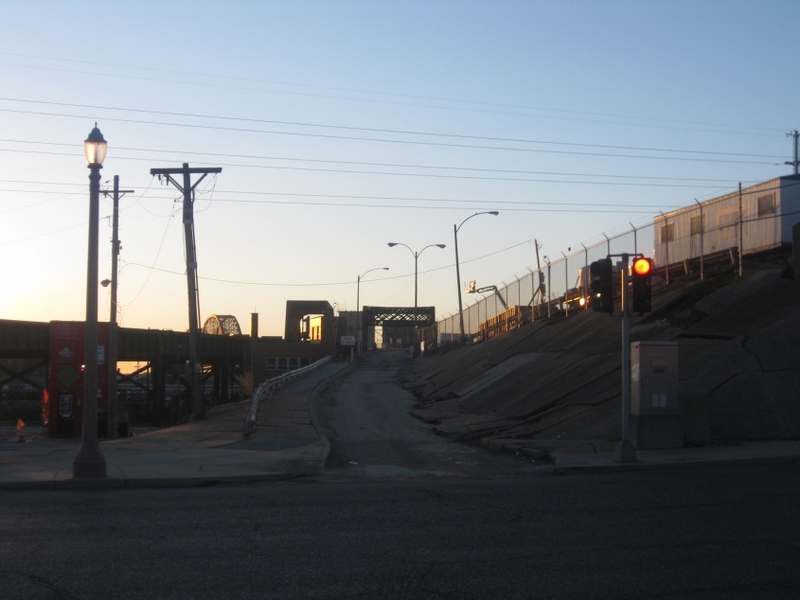 (The bridge's rail approach is at left. The framework for both the road and rail components is in the background at center left.) 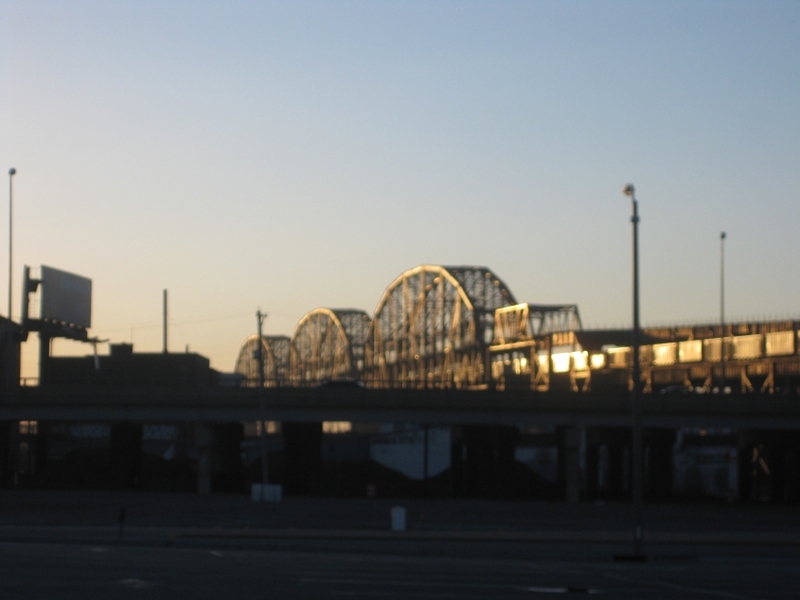 The MacArthur Bridge has been closed to autos since 1981 - but according to different sources, US 40, US 66, US 460, Alt US 67, City US 40, City US 50, and City US 66 had used it at various times. (Are there still any U.S. routes anywhere with a City banner?) 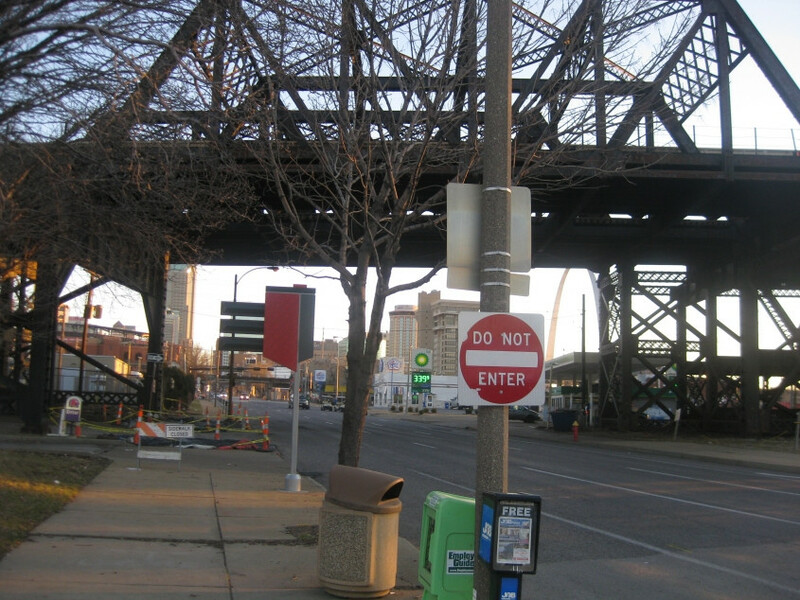 On the right is part of the bridge approach that once went over 7th. In late 2014, highway authorities removed the bridge's road deck because the Department of Homeland Stupidity told them to. 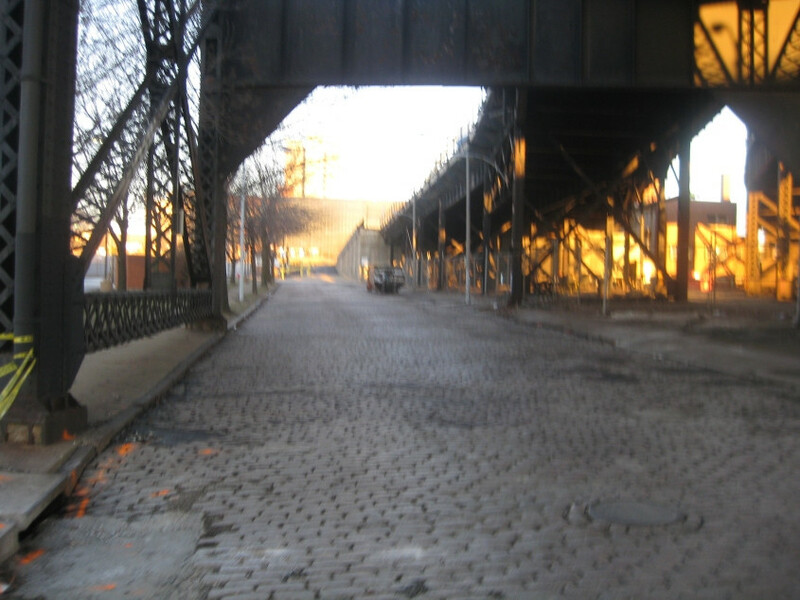 Now the old approach over 7th is on the left. Straight ahead is the remains of a ramp that used to go up to the MacArthur Bridge. Now the ramp in the previous photo has moved to the left. I'll assume the street straight ahead is a disconnected part of Papin Street, though it's roped off. It goes down to 6th. 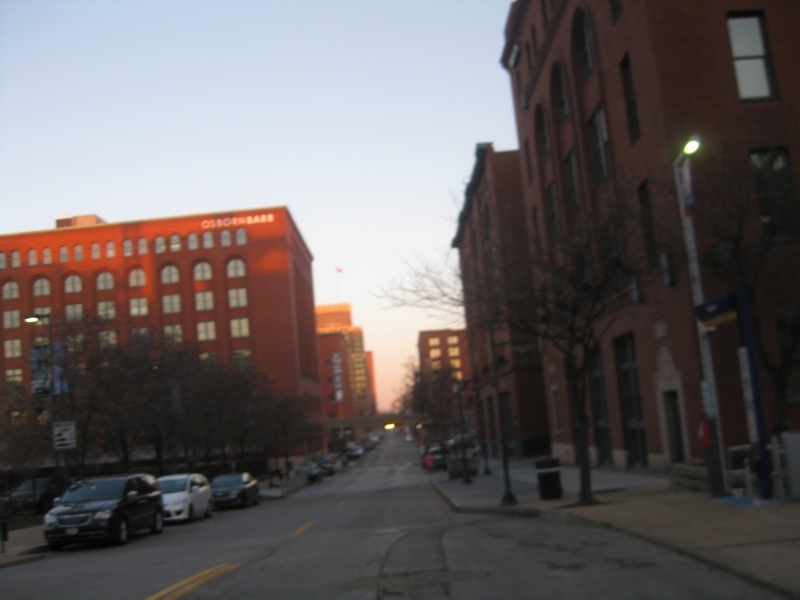 North on 6th from Chouteau Avenue. Up ahead, 6th goes under the old road approach for the MacArthur Bridge. After that, 6th becomes the ramps for I-64. But just before going under the approach, 6th crosses Papin. 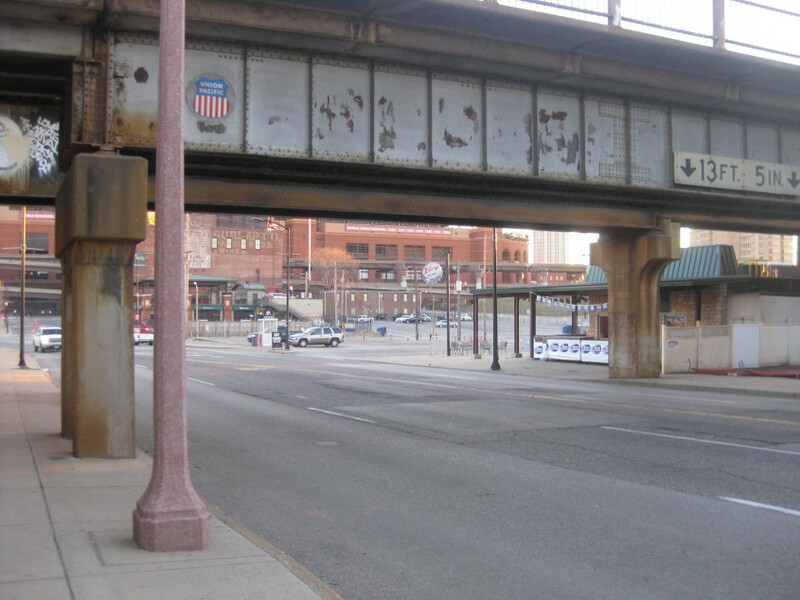 North on Broadway, which goes under both the road and rail approaches for the MacArthur here. Papin comes in from the left. Broadway is where 5th Street would logically be. 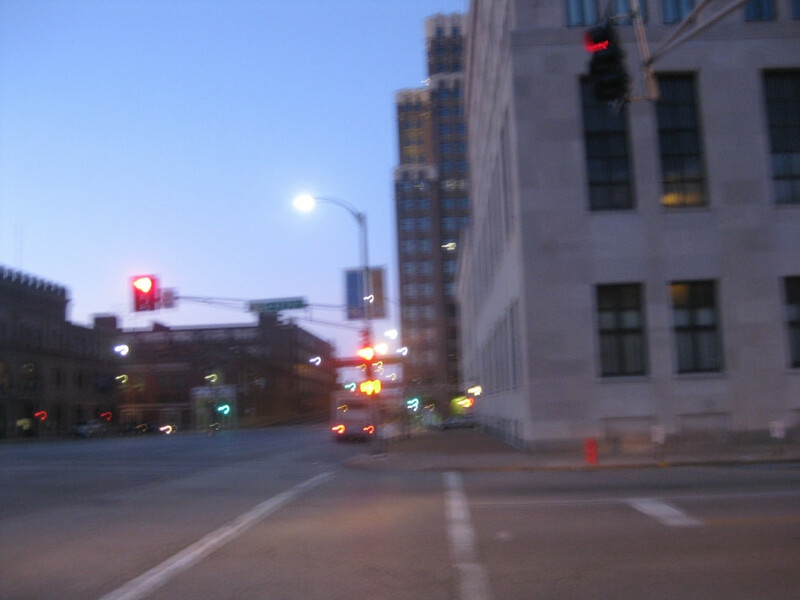 East on Chouteau - MO 100 - from Broadway. You can see Chouteau going under I-44/55. 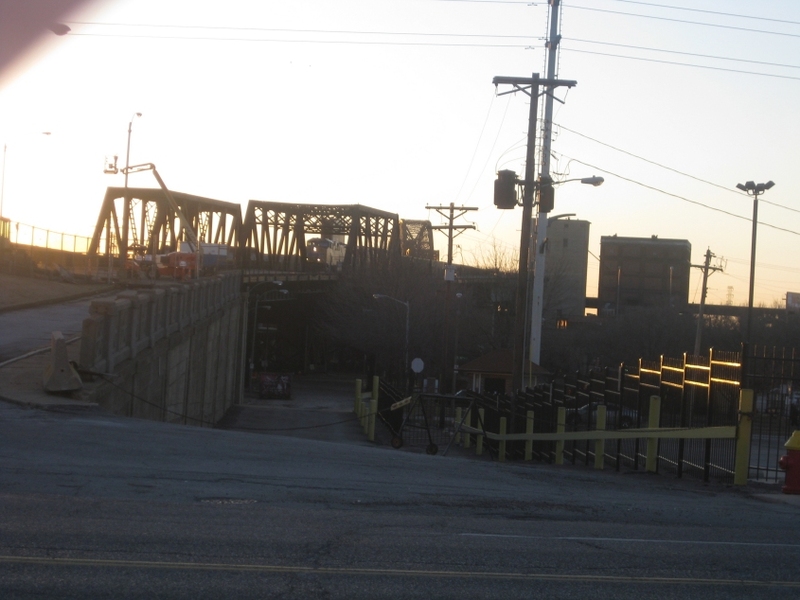 Way in the background, Chouteau goes under a rail bridge. The MO 100 designation ends at I-44/55, even though there's no exit there. 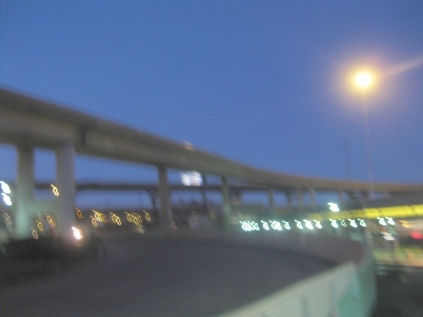 On the left is the MacArthur Bridge approach. West on Papin from Broadway. Here we're under the MacArthur Bridge approach. This view of the MacArthur Bridge shows its twin-storied nature. 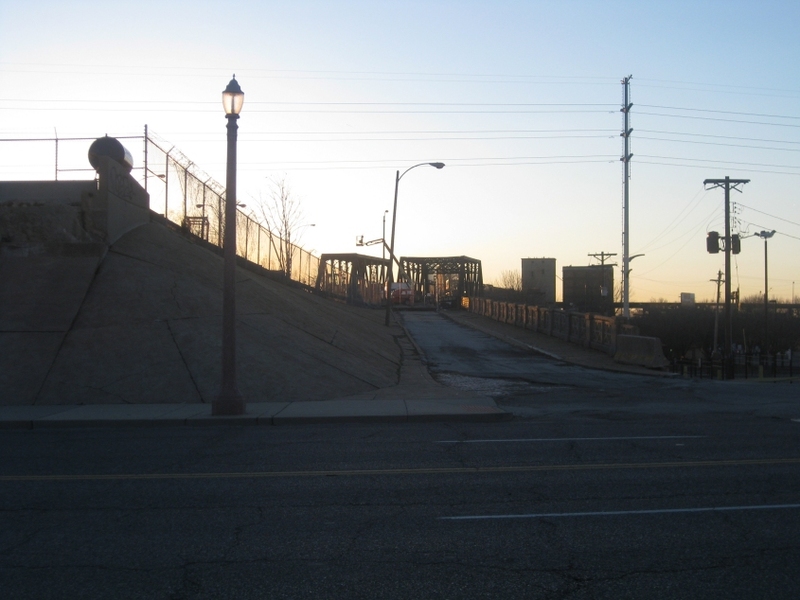 The abandoned roadbed is on top; the rail portion of the bridge is on the bottom.